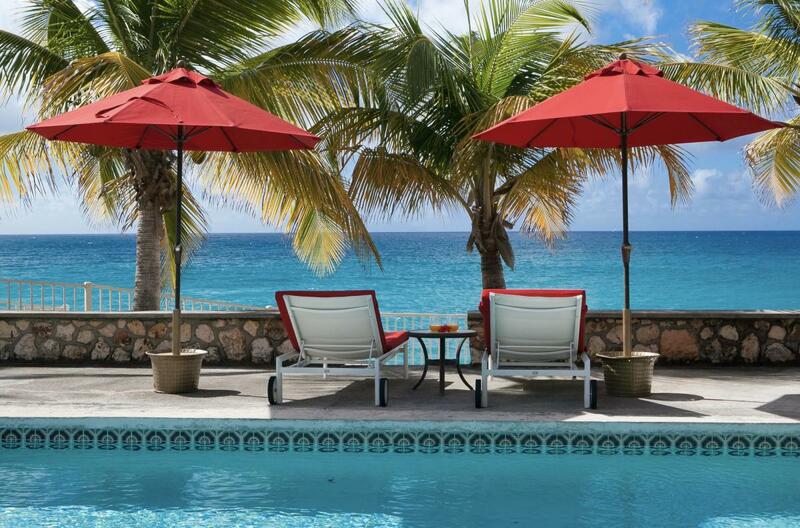 With its contemporary West Indian design, Baie Longue Beach House provides a much-needed relaxing getaway for couples, friends, or families with older children. The 3-bedroom home has plenty of space with its open floor plan that extends right outside onto the partially covered terrace. Meals prepared in the full kitchen are best eaten outside while taking in the great views of the sea, and after dinner you can head down to the beach for a relaxing walk in the sand. There is a private pool at the villa, so this is yet another option for cooling off during the day. For day trips or other excursions, there’s golf, tennis, water sports, restaurants, and much more nearby. This contemporary West Indian style 3-bedroom home is located directly on Baie Longue Beach. There are three air-conditioned bedrooms, one king- and two queen-size beds, each with their own en-suite baths. All three bedrooms open out to the covered gallery that runs the full length of the villa. Two of the bedrooms also open into the main living areas of the villa. There is a large open-air living/dining room with direct access to the covered gallery, perfect for outdoor dining. The sound system has speakers in almost every room as well as around the terrace and pool area. Marble floors throughout give this Caribbean rattan and antique furnished home a very comfortable feeling. There is a swimming pool between the house and the beach. Due to the privacy it provides, this home has played host to many famous people. Caretaker/Gardener lives on property in separate cottage away from main house. There are several dogs on the property that can be penned at your request.